Games Based Learning - The University of Warcraft. I decided to take a little bit of time out from thinking about my PLE/N and concentrate on something slightly different - Games based learning. Research has been carried out indicating that students will learn more and for longer through the use of educational games. Many games are being published in order to teach specific skills to students. As well as arenas such as Second Life being used to run game like simulations. Another body of research has looked at the pedagogical structures and uses of already developed Massively Multiplayer Role-playing Games (mmorpgs) - i.e. World of Warcraft (WOW). These mmorpgs offer a brilliant scaffolding structure and self paced learning model in order to help individuals learn to play the game, as well as embedded connectivist pedagogy to allow knowledge transfer and construction (these are inherently social games). Throughout the lower levels a player learns the individual attributes of his character in order to progress upon personally motivated individually completed quests. In middle levels a player will learn about roles which their particular class can play within small quest parties i.e. a paladin learning how to ‘tank’ for the benefit of the rest of the group. Through these quests persons share knowledge and information in a way to benefit the party and to best achieve a positive outcome. In later stages persons will work together in much larger raiding parties in which micro roles are practised and executed over a series of attempts. Persons need to apply knowledge of their specific race and class in a way which benefits many. So to recap individual orientation quests about base knowledge leads to small group quests, the sharing of class specific knowledge, and the acquisition of group/class specific roles. Finally persons come together to apply all learnt knowledge in a wider context of a large raiding party. Is it just me or, does this sound at all like a University education? Games such as Warcraft have been used within University courses in order to illustrate and engage students in: qualitative research methods; geography; economics; and many other diverse disciplines. However this is not what they were primarily designed for and so the education is a secondary benefit - educators are using already developed non -educational situations and redefining or using them as illustrative options. This is a brilliantly intuitive and positive application, however what if an mmorpg was developed specifically for educational purposes teaching students specific applicable skills in line with the university curriculum - surely this amalgamation of both schools of thought (developing small scale skill specific games + using the brilliant scaffolding structure of an mmorpg) will offer a very immersive and educational arena. Taking the example of World of Warcraft - this could be applied to university education. Imagine the different schools and subjects akin to classes and professions within wow. A student starts out within their start land - conducting low level quests focusing upon the learning needed to give grounding within that field - for example a psychology student may learn research methods, statistics, cognitive psychology, and social psychology through a series of lower level quests. Students would progress through the lower level areas gaining xp just as they would within WOW. Once at high enough levels - having completed enough ‘quests’, the student will be able to progress to newer islands within the school - here different members of the same school will have to group together in order to complete educational 'quests' for example a psychologist, sociologist and health student may need to work together to satisfactorily complete a quest. The final level will be areas open to all students having 'quested' through zones one and two - this zone opens all students into large project based areas in which they need to apply their knowledge as well as working with persons from different schools in order to complete a common goal - a psychologist, physicist, business student, and graphic designer working together in the same way an elf, human and dwarf may in wow - each will bring different attributes and ways of thinking to the group but only together will they succeed. This final level of quests will teach project organisation and problem solving akin to 'real world' graduate positions. The second idea would be to physically ‘play’ through this idea (ideally, I believe a similar progression structure should also be in place through first, second and third years of an undergraduate taught degree anyway.) We are living in a world where more, and more game structures are slipping seamlessly into our everyday lives. Thanks to ‘loyalty’ schemes such as nectar, we are all (gamers or not) now used to collecting points to unlock rewards (see Jesse Schell’s excellent TED talk). New mobile apps such as foursquare are also blurring this line between life and game. Why not then in Education, this is not a new idea and some far more pioneering educationalists than myself have already incorporated alternate reality games within their courses. The idea runs that a person would receive xp for nominal ‘quests’ such as attending lectures and completing readings. They would also compete against classmates on formative assessment quests – the best answers being granted achievements or further XP. Of course this idea of learning within a game structure could be (and has been) applied to motivate a single cohort, and not necessarily ‘fit’ into a wider game structure as suggested previously. These are just my musings and thoughts and as a result of which I have chosen not to format academically complete with references. In this second post on my Personal learning environment I shall start to deconstruct the network to look at some of its constituent nodes. The strength of the network and by association; my knowledge construction lays within the inter-nodal connections. I believe that these connections need to be personally manageable in order to be effective. The ‘personal’ nature of this environment is however not merely about the choice of nodes originally but also a longitudinal construct relating to when I choose to access the information, how I choose to share it, and with whom. I use the idea of push and pull to delineate between different types of nodes (although at a higher meta level I feel all nodes are potentially pull – each allowing us to pull some element we need to continue learning). In this post Push nodes will refer to those nodes which I (or a student) are expected to regularly check in order to receive information which is pushed to them by another i.e. course notes upon a VLE. Pull will refer to those personally chosen nodes which an individual has decided to assimilate into their network for a particular reason i.e. to pull specific information when they need it, not when it is decided by an external that it is needed. I shall start by looking at what I believe to be the most useful online node in my network; this is my personalised Yahoo homepage – MY Yahoo (pictured below). This is admittedly an example of the traditional ‘single space’ PLE which I discussed in the previous post, my point again here is that it is extremely useful as a hub, but that at the end of the day it is not the entire PLE rather just a single node in a much larger environment. I have come to view this page as a kind of mission control. Upon the page I have many self chosen portlets through which I pull information from sources which I have chosen. 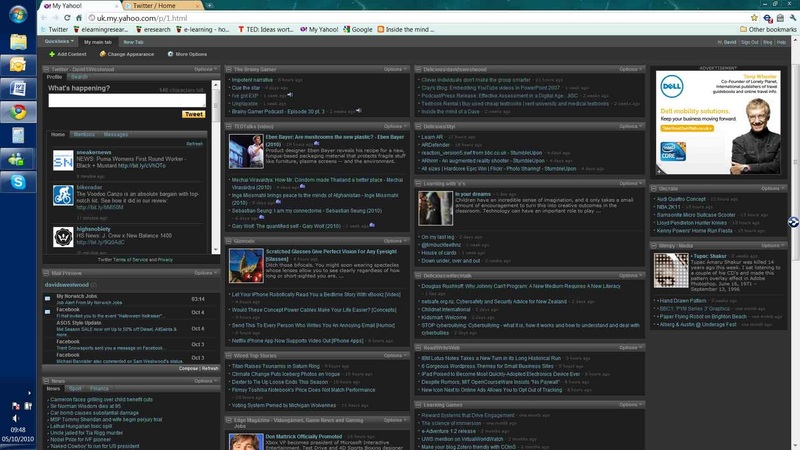 In the top left I have my Twitter feed more - on the use of twitter in a PLE in later posts. I also have my Email, these portlets mean i do not need to switch between multiple tabs in order to pull information from these nodes – they are constantly updated upon a single sheet. The main body of the page is constructed as an rss aggregator – this area allows me to pull (or have pushed depending on your thinking about rss subscription) new posts from blogs and websites which i have decided to assimilate as nodes into my network. All of these nodes allow me too constantly and consistently review new published information, and in turn constantly re-evaluate my knowledge and understanding. These nodes could potentially all sit out in the cloud waiting for me to remember to go and check them – MY Yahoo has allowed me to ‘tie down’ these satellite nodes into a singular space which I can easily check whenever personally necessary. 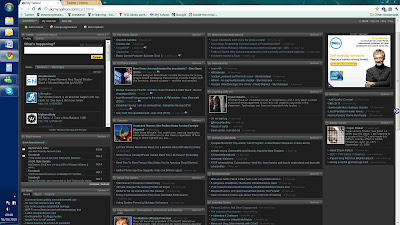 The final portlets are feeds from the delicious site of members of my network (again more on delicious later) these are fantastic portlets as they allow me to pull sites which other members of my network have decided are interesting – this cloud sourcing of information allows me to cast a much wider net and pull information from a great many new nodes thus constantly widening my network. I believe that the true value of a personalised homepage such as My Yahoo is that it allows many many potentially difficult to connect to nodes to be aggregated together into a simple easily used single node, a result of which is the ability to negate alot of potential ‘virtual leg work’ when looking for new ideas or information in a constantly shifting and changing sector of research.